BMW 2 Series 218d SE 2dr [Nav] 2019 Review | What Car? What Car? will save you at least £2,146, but our approved dealers could save you even more. If you're in the market for a Coupé it's well worth looking at the Audi TT Coupé, but the BMW 2 Series Coupé is cheaper, stylish and has substance, too, including its relatively practical and smart-looking interior. 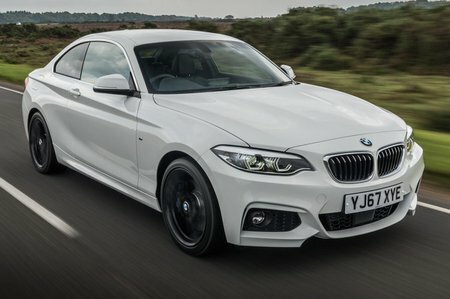 The diesel engines are all great performers and cheap to run (if a little gruff), while the M240i's six-cylinder turbocharged petrol engine is both sonorous and seriously quick. Features include 17in alloy wheels, air-con, BMW’s 6.5in colour screen iDrive infotainment system with DAB radio, sat-nav and Bluetooth, LED headlights, rear parking sensors and automatic lights and wipers. This 148bhp 2.0-litre diesel is a pleasure to drive, with 0-62mph in 8.3sec (automatic version), good mid-range pull and low running costs — over 50mpg on the WLTP combined cycle and relatively low CO2 emissions. If you're considering one over the petrol versions and you're a company car driver, don't forget to factor in the four per cent diesel benefit-in-kind surcharge, though.